Cards can only be redeemed in-store at Streetbike. No change will be given but the balance can be used against future purchases. The balance will be updated after each transaction and shown on the printed till receipt. They may be exchanged for goods of a higher price than the value on the card on payment of the difference. If any product purchased with a gift card is subsequently exchanged for a product of lower price or a refund, any money owing will be issued as a gift card. They may not be exchanged for cash. They are not a cheque guarantee, credit, debit or charge card. Streetbike cannot be held liable for lost or stolen cards – protect this as you would cash. To add more value or check the balance please bring the card in-store. Your gift card will expire after 24 months from the date of last use and any remaining balance cancelled on expiry. 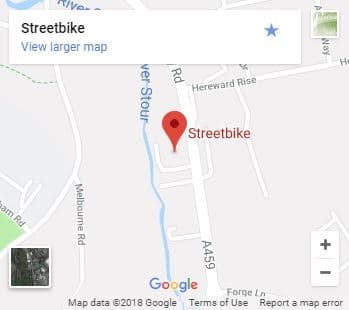 Streetbike reserve the right to amend terms and conditions of our gift cards at any time and take appropriate action, including cancellation of a card, if necessary.